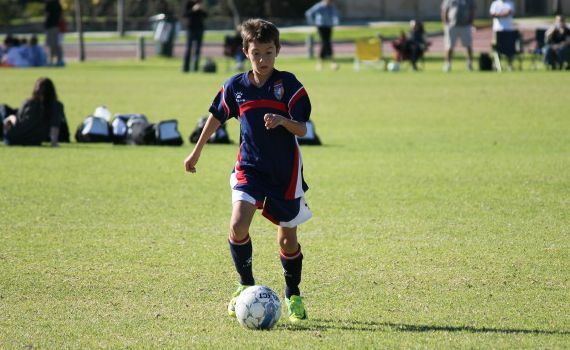 The 11s have improved week after week so it was always going to be hard for the visiting Subiaco team. The boys have continued their development as a team this year with great enthusiasm with all the boys willing to play in whatever position they are told. A good team needs a good defence and the 11s have been superb. The Subiaco team started quickly from the kick off and Reid had to be alert and stop the ball. The boys get the ball straight up the other end. Jack beats the keeper but the goal is disallowed. The wide play from the boys has been fantastic this year, Ollie and Trent continue to terrorise on the right. Ollie draws the defenders deep and passes the ball back to Trent who crosses the ball to Josh who volleys over. The boys only like to play in the opposition half as Ollie wins another corner. After the ball is half cleared by the Subiaco defence Evan strikes the ball low into the corner but the keeper gets his hands on the ball to make a good save. The play is switched to the left by Dylan who finds Ciaran. With the defence dropping deep Ciaran passes it back to Kian who shoots from 20 yards. It’s another long bomb from Kian! The keeper had no chance stopping that. 1-0. Josh and Dylan are controlling the ball in the middle showing some great skills. Evan is working hard at the back. He’s not defending but getting the ball and switching the play. Ciaran beats a defender and passes the ball to Josh who shoots low. The keeper saves well. Evan, Trent and Ollie work well to win a corner. Josh’s bicycle kick is just wide of the post. The Subiaco team are doing well to contain the wave after wave of ECU attacks. Josh and Dylan continue to move the ball out to Ollie and Ciaran. It won’t be long before they find an opening. Josh beats a player and passes to Dylan who sees Ollie in space. Ollie shoots low into the right corner with the keeper unable to reach it this time. 2-0. Subiaco push forward but Evan is waiting to stop the Subiaco player. With the game being played mostly in the Subiaco half Evan pushes forward and is rewarded with his 20 yard shot going in. 3-0. ECU keep playing the ball around. Jack is close with a volley, Ciaran heads just over and Dylan shoots wide. As the half finishes Evan and Trent make some good tackles. The second half gets under way and Subiaco start strongly. Evan covers well and Ciaran heads clear from a corner. Josh pushes forward and shoots on target, the keeper looks to have it covered but instead helps it over the line. 4-0. Morgan is back in the middle for the second half. He immediately takes the ball up field and has a shot but it goes just over the bar. Charlie is next to have a chance. His shot is low and wide. Morgan has another chance and this time he gets his shot on target. The keeper makes a good save. Ben makes a dazzling 30M run, he manages to get a shot away but the keeper saves again. Morgan works hard to help out the back three with some great tackles. When the Subiaco team do get past the midfield Evan, Josh and Kian are always waiting to stop them. The boys were unlucky not to increase the lead with Charlie heading over, Trent shooting wide, Ciaran shooting wide and Dylan’s shot saved. Morgan is quickest to react after Dylan heads the ball onto the crossbar but his shot is just over. Dylan passes the ball out to Charlie who sees Jack making a run forward. He crosses the ball and Jack slots the ball past the diving keeper. 5-0. The game is almost over but the boys keep pushing forward looking for more goals. Morgan, Charlie, Jack all go close. A great game and deserved win for the 11s. They again dominated all aspects of the game and could have scored more goals. Also they kept a clean sheet as teams are finding it very difficult to get any possession of the ball.